It's been only a few hours since the first purported live image showcasing the upcoming Samsung Galaxy S7 got outed. And now it's time for the Galaxy S7 edge to get the exact same treatment. The difference is that in this case, we're shown the curvy front of the handset, whereas with the 'vanilla' S7 all we saw was its back. The Galaxy S7 edge comes with a curved screen, as you'd expect, and the picture shows the results of putting it through the paces of the AnTuTu benchmark. 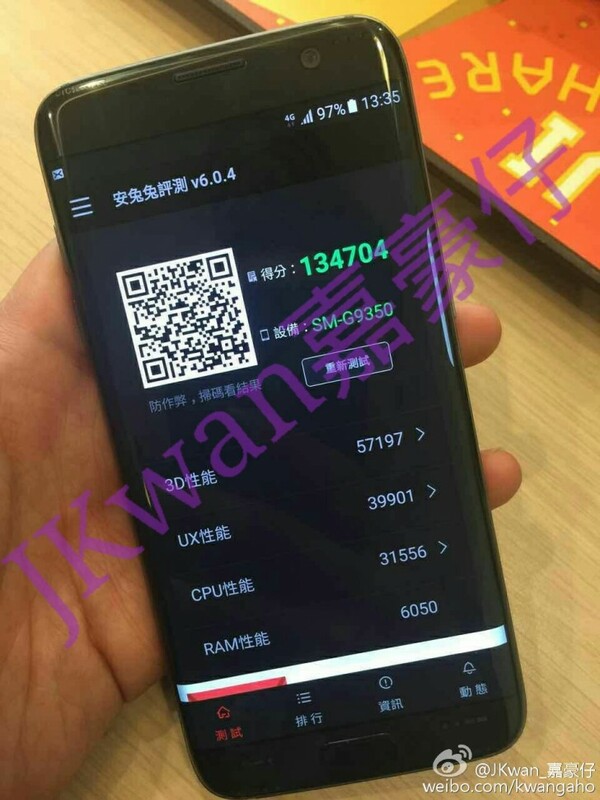 This benchmark run is available in AnTuTu's database, which sort of confirms the authenticity of this leak. That said, many people do have Photoshop skills, do keep in mind. Anyway, if this is real then the S7 edge's model number is confirmed too, as being SM-G935 (followed by another number or a letter depending on which area it's going to be sold in). According to past leaks, the Galaxy S7 edge will have a 5.5-inch QHD AMOLED touchscreen, the Samsung Exynos 8890 chipset or the Qualcomm Snapdragon 820 (depending on market), 4GB of RAM, a 12 MP rear camera with f/1.7 aperture, a 5 or 8 MP selfie camera, 32 or 64GB of storage, a microSD card slot, and a 3,600 mAh battery. It should run Android 6.0 Marshmallow, with Samsung's TouchWiz UI on top. One of its differentiating features (also to be seen on the plain S7) could be Always On Display. Not fake, score about right with that monster Mali 880MP12 GPU inside, Adreno 530 should score about the same, but I expect the 8890 to be 10-15% faster due to much better multicore score. Even the most dedicated and braindead Samsung haters have to admire those specs. Any idea when we'll know what colour options will be available? Will the edge have a toolbar on either side instead of being a purely cosmetic feature?